HAROLD HOLZER is one of the country's leading authorities on Abraham Lincoln and the political culture of the Civil War era. A prolific writer and lecturer, and frequent guest on television, Holzer serves as chairman of The Lincoln Bicentennial Foundation, successor organization to the U. S. Abraham Lincoln Bicentennial Commission (ALBC), to which he was appointed by President Clinton in 2000, and co-chaired from 2001–2010. President Bush, in turn, awarded Holzer the National Humanities Medal in 2008. And in 2013, he wrote an essay on Lincoln for the official program at the re-inauguration of President Barack Obama. He is serving currently as the first Roger Hertog Fellow at The New-York Historical Society. Harold Holzer has authored, co-authored, and edited 49 books. His latest major book, Lincoln and the Power of the Press: The War for Public Opinion, won the 2015 Gilder Lehrman Lincoln Prize. Other recent titles include President Lincoln Assassinated! !, a Library of America Anthology of public and private responses to Lincoln's death, Exploring Lincoln, and a new edited collection of scholarly essays by leading historians. Holzer has also issued the 2014 book The Civil War in 50 Objects, written for The New-York Historical Society. His other recent volumes include 1863: Lincoln's Pivotal Year, co-edited with Sara Gabbard; Lincoln: How Abraham Lincoln Ended Slavery in America, the official young adult companion book to the Steven Spielberg film; and Emancipating Lincoln: The Emancipation Proclamation In Text, Context, and Memory (Harvard University Press), which Henry Louis Gates Jr. called an “essential guide to Lincoln’s Emancipation Proclamation.” In 2013 Holzer was one of 10 historians invited by the U. S. Senate to contribute essays (his on the Emancipation Proclamation) to the official portfolio for the second inauguration of President Barack Obama. The Library Journal “highly recommended” his 2008 book, Lincoln President-Elect: Abraham Lincoln and the Great Secession Winter 1860-1861 and Doris Kearns Goodwin called it a "stunningly original work that casts completely new light on the most turbulent and critical presidential transition in American history." His book Lincoln At Cooper Union: The Speech That Made Abraham Lincoln President (2004), won a second-place 2005 Lincoln Prize, the most prestigious award in the field. In addition, Holzer has written more than 525 articles and reviews for both popular magazines and scholarly journals, including Smithsonian, Life Magazine, American Heritage (where he served as a Contributing Editor), Civil War Times, American History Illustrated, North & South, Blue & Gray, The Wall Street Journal,The Washington Post, The Chicago Tribune, The New York Times Book Review and Op. Ed pages, and The Los Angeles Times. His regular column, "Cease Fire," appears in America's Civil War, and he contributes regularly to the Civil War websites of The New York Times and Washington Post. Holzer has also written chapters to more than 50 books as well as a number of pamphlets and monographs on Lincoln, including Lincoln and The Jews (2002), and Standing Tall: The Heroic Image of Abraham Lincoln (2005). And Holzer has contributed chapters and forewords to 51 additional books, including Lincoln and His Contemporaries (1999), The Lincoln Enigma (2001), Our Lincoln (2008), and The Mary Lincoln Enigma (2012). In 2004, he was the historical advisor to the book Why Lincoln Matters by the late Mario M. Cuomo. Harold and Craig Symonds sign copies of "The New York Times Complete Civil War" in 2010. A frequent guest on television, Holzer has appeared often on C-SPAN, including Washington Journal and Q&A as well as on the 2008 special series, The White House and on C-SPAN3 (American History TV) and several C-SPAN specials devoted to The Civil War Sesquicentennial (2010–2015). He also appeared on the 2005 History Channel special Lincoln; on that network's History Center series, on American Heritage Presents the Lincoln Assassination (1995), and the specials Assassins: John Wilkes Booth and Investigating History: Lincoln-Man vs. Myth. He has appeared on The Today Show, The Charlie Rose Show, The Lou Dobbs Show, CNBC, CNN, Fox News, The News Hour with Jim Lehrer, CBS Sunday Morning, Bloomberg News, and the CBS Evening News. He appeared on the C-SPAN American Writers special on Abraham Lincoln, and was also seen on C-SPAN in broadcasts of his stage presentations Lincoln Seen and Heard with Sam Waterston and Grant Seen and Heard with Richard Dreyfuss. Holzer's appearance on C-SPAN's Booknotes series inspired the 1994 C-SPAN recreations of the Lincoln-Douglas debates in Illinois, for which Holzer served as historical consultant and on-air commentator. C-SPAN also broadcast the 2004 on-site re-creation of The Cooper Union address, featuring Holzer and Waterston, and in February 2005 a special Lincoln's Birthday-eve performance of Lincoln Seen and Heard live from the White House, hosted by President and Mrs. George W. Bush. He also twice appeared on the award-winning PBS discussion show Open Mind and on C-SPAN in the performance piece The Lincoln Family Album starring Liam Neeson and Holly Hunter, broadcast from the Library of Congress in Washington. He appeared to introduce the C-SPAN broadcast of a Cooper Union dialogue In the Lincoln Tradition. His most recent program, "The Real Lincoln-Douglass Debates," featuring actors Stephen Long and Norm Lewis, was performed twice at The Metropolitan Museum of Art and aired on C-SPAN. His "Lincoln's Shakespeare," featuring such actors as Mr. Lang, Sam Waterston, John Douglas Thompson, Kathleen Chalfont, Fritz Weaver, and Chris Noth, has been performed at several venues, including the Berkshire Playhouse. For the 2009 Lincoln bicentennial, Holzer appeared on a number of national television specials, including Q&A with Brian Lamb from Washington’s Willard Hotel; Bill Moyers Journal on PBS, with Sam Waterston in a new reading entitled “Lincoln In American Memory,” and in the documentaries Looking For Lincoln (PBS), Stealing Lincoln’s Body (History Channel), and Lincoln: American Mastermind (National Geographic Television). 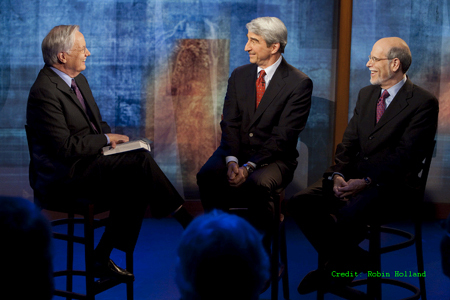 Bill Moyers, Sam Waterston and Harold at the taping for "Bill Moyers Journal" on 3/16/09 at the PBS studios in New York. Holzer also lectures widely before Civil War and Lincoln groups and at museums, colleges, and historical societies conferences throughout the country. Among the more than 150 different talks he has given across America on land as well as on the nation's rivers, Holzer has delivered the McMurtry Lecture at the Lincoln Museum in Fort Wayne, the Lincoln Shrine Lecture in Redlands, California, and the Frank and Virginia Williams Lecture at LSU/Shreveport. In 2004, he delivered the Fortenbaugh Lecture at Gettysburg College and the second annual NEH "Heroes of History" lecture at Ford's Theatre in Washington. In 2005, he was the featured speaker at ceremonies marking the anniversary of Lincoln's Gettysburg Address at the Solidier's Cemetry in Gettysburg, PA. His bicentennial year lectures took him from Oxford, England to Boise, Idaho, and some 25 major venues in between, including as American Pictures Distinguished Lecturer at The Smithsonian Institution in April 2009. In 2011, he delivered the prestigious Nathan I. Huggins Lectures at Harvard University's W.E.B. Du Bois Center for African and African American Research. During the first years of the Civil War sesquicentennial, he lectured at such venues as Ford's Theatre, The National Archives, The Albany Institute of History and Art, Dartmouth College, Centre College, Long Island University, The Gettysburg National Military Park, The American Antiquarian Society, History Miami, The State Museum of Pennsylvania, Mary Washington College, the Park Avenue Armory, The White House Historical Association, Temple University, The U.S. Capitol, and in an ongoing series of Civil War conversations at The New-York Historical Society, where he moderates a regular series on Civil War history. He appeared in programs with Tony Kushner, award-winning screenwrite of Spielberg's Lincoln, at such venues as The Union League of Chicago, The Civil War Round Table and Lincoln Group of New York, The Museum of The Moving Image, The New-York Historical Society, and Hunter College. He has also organized several Lincoln symposia and curated six museum exhibitions, notably the award-winning 1999 Lincoln Museum exhibit "Lincoln From Life." He served as lead historian for several exhibitions and symposia at the New York State Museum in Albany, including State of the Union: New York and the Civil War. Holzer has curated or served as chief historian for a number of acclaimed museum exhibitions, including The Lincoln Image (1984-85), which appeared at The Lincoln Museum, Gettysburg College Library, and other venues; The Confederate Image (The Lincoln Museum, Gettysburg College), Lincoln From Life (The Lincoln Museum), Lincoln and New York at the New-York Historical Society, and the 2015 show, Lincoln and the Jews at the New-York Historical Society. In February 2007 he helped organize and debut a new “Lincoln Series” of modern political debates and dialogues in the Lincoln tradition at New York’s Cooper Union, the first of which featured Mario Cuomo, Newt Gingrich, and the late Tim Russert, and later presented Senator John Edwards, Mayor Michael Bloomberg, and President Barack Obama. In 2012 Holzer advised New York Governor Andrew Cuomo on the rehabilitation and reinstallation of the historic but neglected Hall of Governors portrait gallery at the New York State Capitol and co-organized a statewide tour of Lincoln's handwritten Preliminary Emancipation Proclamation. In 2012, Governor Cuomo appointed him co-chair of the N.Y. State "Pathways Through History" initiative. Much honored for his work, Holzer won a second-place Lincoln Prize for his Cooper Union book in 2005, and won the prize itself in 2015. He has seven times won the Barondess Award of the Civil War Round Table of New York (1984, 1990, 1993, 2005, 2009, 2015; plus honorable mentions in 1999 for the exhibition Lincoln from Life and again in 2010 for the exhibition "Lincoln and New York"). He has also received the Diploma of Honor from Lincoln Memorial University (1988); won the Award of Achievement from the Lincoln Group of New York six times (1988, 1993 2004, 2009, 2010, and 2015); received a 1988 George Washington Medal from the Freedom Foundation; a 1989 Writer of Distinction Award from the International Reading Association; and a 1993 Award of Superior Achievement from the Illinois State Historical Society along with the special bicentennial "Order of Lincoln" award, the highest honor bestowed by the State of Illinois for the study of Lincoln and the Civil War era. In 1996 he won the first annual award from the Manuscript Society of America for his use of original manuscripts in Dear Mr. Lincoln. The Union Image won the 2000 Newman Book Award of the American Historical Print Collectors Society. In 2002 Holzer received the coveted Nevins-Freeman Award of The Civil War Round Table of Chicago, and his young reader's book, The President is Shot! won several awards. Lincoln President-Elect was named a best book of 2008 by the Illinois State Historical Society. Holzer has earned honorary degrees from Lincoln Memorial University, Lincoln College (2002), Illinois College and The University of Massachusetts at Dartmouth (2006). He was honored in 2009 by both Bard College and Queens College. In 2011 he earned honorary degrees from both Culver-Stockton College in Missouri and Highland College in Freeport, Illinois, and in 2011 from Centre College in Danville, Kentucky. His book Abraham Lincoln, The Writer (2000) was named to both the Children’s Literature Choice List, and the Bank Street "Best Children’s Books of the Year, and his most recent young reader’s history, "Father Abraham," has won a number of awards, including the first James "Bud" Robertson Award for Best Young Readers’ Book from The Civil War Round Table of New York. Holzer has earned lifetime achievement awards from The Lincoln Group of The District of Columbia, The Lincoln Group of Peekskill, NY, and The Civil War Round Table of Chicago (The Nevins-Freeman Award), among others. In 2015 he won The Harry S. Truman Award from The Civil War Round Table of Kansas City (a group co-founded by the ex-President in the 1950s). 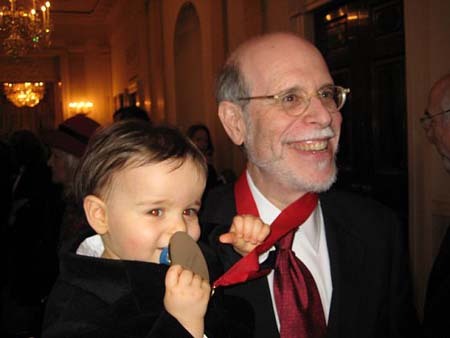 Harold poses with his grandson Charlie after receiving the National Humanities Medal at the White House. From 1991-1996, Holzer served as president of the Lincoln Group of New York, and still serves on its executive committee. He also served on the board of directors of the Abraham Lincoln Association and New York's Civil War Round Table, and on the editorial advisory board of The Lincoln Herald. Holzer is founding vice chairman and a regular lecturer at The Lincoln Forum, which hosts an annual symposium each year in Gettysburg, and serves on the Board of Directors of the Ulysses S. Grant Association. He was also a member of the Research Advisory Group for the President Lincoln and Soldiers' Home National Monument in Washington, and of the board of historical advisors of the Mariners' Museum's U.S.S. Monitor Center in Newport News, Virginia; the Tredegar National Civil War Center Foundation in Richmond; The National Constitution Center in Philadelphia; The Ford's Theatre National Historic Site, including its new Education Center; The Lincoln Museum at Lincoln College in Lincoln, Illinois, and the Gettysburg National Military Park Visitor Center. At the U.S. Lincoln Bicentennial Commission, he helped plan and organize programs and celebrations to mark Lincoln's 200th birthday, and today he leads its successor organization, The Lincoln Bicentennial Foundation, in supporting public and educational programs nationwide. In February 2006, Holzer was also named co-chairman of The New York State Lincoln Bicentennial Commission by Governor George E. Pataki. A former member of the New York State Council on the Humanities, Holzer was appointed by Gov. Mario Cuomo to the New York State Archives Preservation Trust Board in 1994, was re-appointed by Gov. Pataki in 1999, again by then-New York State Senate Minority Leader David Paterson in 2004, and then by the State Board of Regents in 2008. In this role he co-organized and served as lead historian for a Union Preserved Civil War symposium in Albany, co-edited two Archives-sponsored books on New York and The Civil War, hosted events featuring actor Richard Dreyfuss, C-SPAN founder Brian Lamb, actor Sam Waterston, and historians Doris Kearns Goodwin, Henry Louis Gates Jr., and Robert Caro; and co-organized a 2012 Lincoln Symposium at the Albany Law School. Educated at the City University of New York, Holzer began his career as a newspaper reporter and, later, editor of the New York weekly The Manhattan Tribune. He then served as a political campaign press secretary for Congresswoman Bella S. Abzug (in her campaign for the U.S. Senate and mayor of New York) and future Governor Mario Cuomo, a government speechwriter for New York City Mayor Abraham D. Beame, and for six years as public affairs director for the PBS flagship station WNET. From 1984 through 1992 he served as Special Counselor to the Director of Economic Development and executive vice president of The New York State Urban Development Corporation in the administration of Governor Mario Cuomo. Holzer currently serves as Senior Vice President for Public Affairs at The Metropolitan Museum of Art in New York, the largest and most comprehensive art museum in the western hemisphere. He joined the museum as Chief Communications Officer in 1992 and was named vice president in 1996 and senior vice president in 2005. His responsibilities include Government Affairs, Multi-Cultural Audience Development, Admissions, and Visitor Services. Holzer will retire from The Met in July 2015 after 23 years at the Museum. Holzer lives in Rye, New York with his wife of 44 years, Edith Holzer, former director of public affairs for the New York State Council of Child Caring Agencies. The Holzers have two daughters: Meg, an attorney who attended Yale University and NYU Law School, and Remy, a Harvard graduate with a Masters in Film Studies from NYU who is an independent film historian; she is married to author and book critic Adam Kirsch of Columbia University. The Holzers have one grandson, Charles Ezra Kirsch. 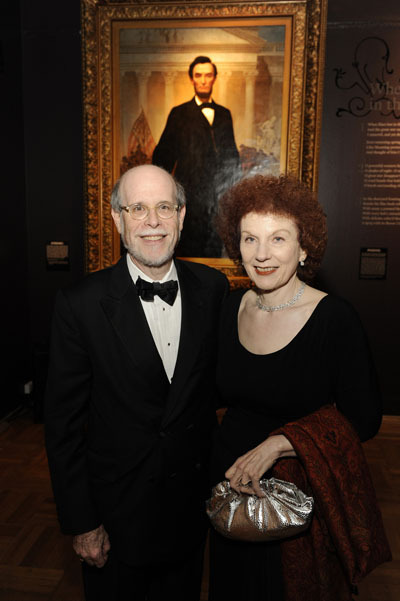 Harold and Edith at the gala reception for Lincoln and New York at the New-York Historical Society. For a complete list of books and articles, as well as details on the titles listed above, see here. M honorable mention in 2010 for "Lincoln From Life"